Good luck to Kate Rawles who is Shortlisted for Banff Mountain Festival ‘Adventure Travel’ Book Award, 2012. 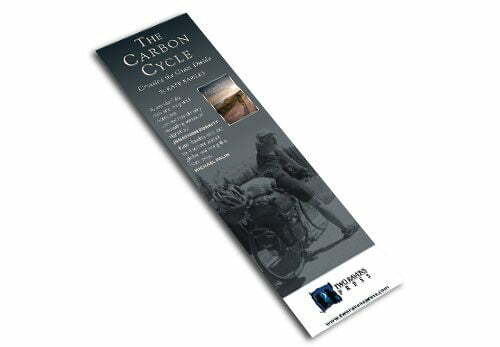 We worked with Kate in creating promotional material for her book, The Carbon Cycle. The Carbon Cycle is a 4,500 mile bike ride along the spine of the Rockies to explore North American responses to climate change. Along the way, Kate talked to Americans about climate change – from truck drivers to the Mayor of Albuquerque – to find out what they knew about it, whether they cared, and if they did, what they thought they could do. Kate’s story of the trip, in which she not only deals with the rigours of the journey (cycling for ten hours a day in temperatures often in excess of 100F, fighting punctures, endless repairs, inescapable grinding fatigue …) but does constant battle with her own ideas and assumptions, helps us to cross the great divide between where we are on climate change, and where we need to be. You can buy the book from Two Ravens Press.